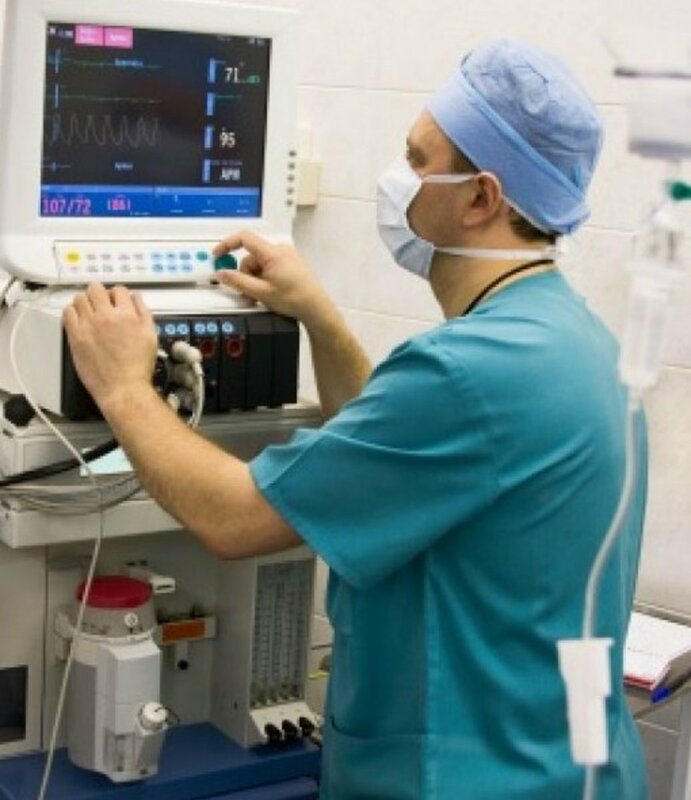 Your anesthesiologist monitors vital signs and adjusts anesthetic throughout your surgery. For some procedures and surgeries, you may have a choice regarding the type of anesthesia used. Many times, though, the only good choice will be general anesthesia. In this article I will give you a broad introduction to terminology, procedure, and what to expect. General anesthesia means loss of consciousness. If you are "under" with general anesthesia, you cannot feel, see, or hear anything, and you do not respond to even painful stimuli. After checking in with a nurse and having an IV placed, you will meet your anesthesiologist to discuss your anesthetic. Midazolam or other sedatives are often given prior to other medications to "take the edge off." You may get this type of drug before you even leave the pre-op room. These drugs kick in within a minute and make you forget anything that happens for a period of time afterward, although the effect varies from person to person. For this reason, you may have no recollection (or only vague memories) of entering the operating room. After you go to the operating room, you will be given oxygen to breathe and will have monitors such as a blood pressure cuff, an oxygen monitor, and EKG stickers placed. Most commonly, your general anesthetic is induced with medicines injected into your IV. Anesthesia providers use a combination of medications that function as sedatives, pain relievers, and hypnotics for the induction (getting you to sleep) phase of general anesthesia. You may or may not remember this if you were given a sedative in the pre-op phase. Once you are unconscious, your anesthesiologist will make sure you are getting enough oxygen and anesthesia. To do this, he or she may need to use a breathing device to help keep your airway open. There are various ways to do this, including using just an oxygen mask, an LMA (a soft rubber mask that sits inside of your mouth, just over the opening to your windpipe), or a breathing tube that slides into the windpipe between the vocal cords. The decision regarding the type of airway device is based on many factors, including any medical problems that you have and the type of surgery planned. Oxygen levels are monitored and maintained the whole time you are "asleep." "Maintenance" refers to the process of keeping you "asleep"/"under" for the entire surgery. Usually a combination of gas, IV hypnotics, and strong pain medication are used for this important stage. 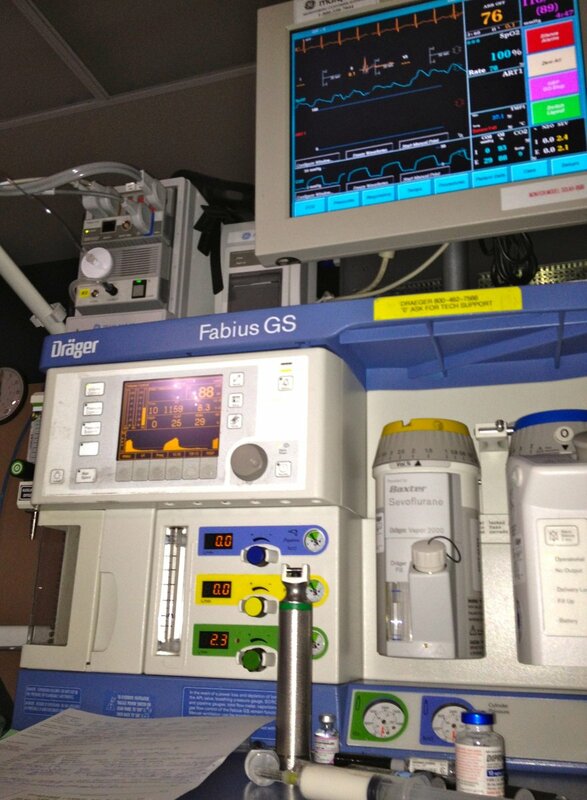 During this phase, your anesthesiologist stays with you, carefully monitoring your vital signs and keeping you safe. Your anesthesia is adjusted throughout the operation based on what is going on in the surgery. For example, it will be "lighter" during the time that the nurse is washing the surgical area with sterilizing soap—you need less then because this is not painful or disruptive for your body. Too much anesthesia when it is not needed causes the heart rate and blood pressure to drop. When the surgeons are ready to begin, your anesthesiologist will make adjustments to make sure you have enough. Your unconsciousness is maintained by watching your heart rate, blood pressure, and breathing rate. Medications are increased or decreased based on your specific needs during that surgery. In other words, every anesthetic is customized to the needs of the patient. When the surgery is over, the anesthesia gases are allowed to dissipate. Titration of pain medication continues so that you do not wake up in pain. You will move through stages of consciousness until, at last, you are awake and the breathing mask or tube is removed. Don't worry, you won't likely remember this, though. Most people don't realize they are awake until some time later in the recovery room. Our anesthetics are much shorter-acting than those of ten years ago, but they are still going to make you feel pretty sleepy for the rest of the day after your surgery. General anesthetics have the unfortunate side effect of nausea and vomiting. If you are particularly prone to nausea (for example, from motion sickness), make sure to tell the nurses and doctors in the pre-op area. There are meds they can give you to minimize this side effect. The pain medicines you will take after surgery have many of the same side effects. So, if you are still sleepy and experiencing nausea a couple days after your surgery, it more likely results from narcotic pain medicines than the anesthetic. 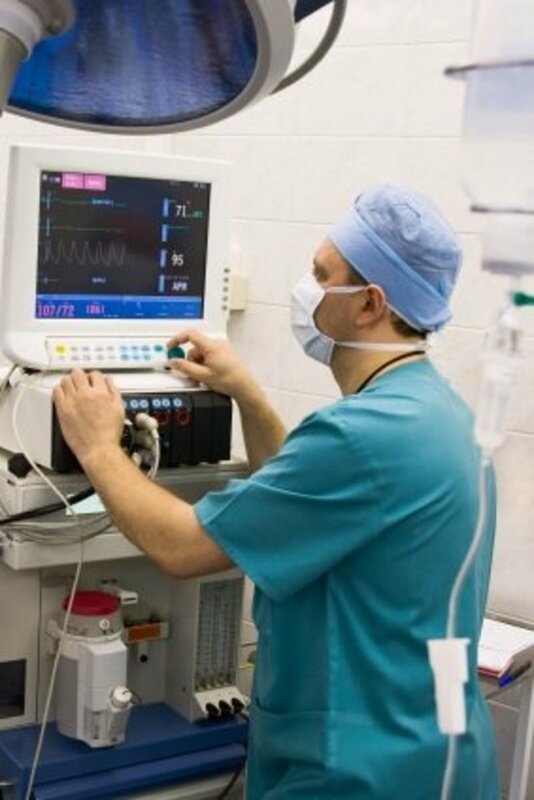 Anesthesiologists monitor all of your vital signs, continuously, throughout the surgery. Increases in heart rate, breathing rate, and blood pressure all signal "light" anesthesia. Changes do not mean you are awake. Your autonomic nervous system reacts to the stressful stimuli of surgery long before you wake up. You actually move involuntarily as a reaction to the surgery while still unconscious, as well. Anesthesia awareness is an unfortunate situation where you are not fully unconscious during the surgery. People with true anesthesia awareness later report that they heard some of what was going on in the operating room. Usually, they can't feel anything, but may be very scared. Rarely, they can feel the surgery but can't move or speak. People who have medical or surgical issues where giving deep anesthesia is dangerous are at more risk for true anesthesia awareness. Why do you say "true" anesthesia awareness? There are many, many cases when people think they have been awake during general anesthesia, but in fact, they are mistaken. The most common scenario involves a surgery where they had sedation anesthesia or sedation in combo with a spinal, epidural, or regional anesthetic. Those types of anesthesia do not and are not supposed to induce unconsciousness. It is absolutely normal to have memories and be at least partially awake with these types, but memories may be fuzzy due to the drugs used. Could you use a brain monitor to prevent anesthesia awareness? Brain monitors have not been shown to provide protection from anesthesia awareness, but don't worry, your anesthesiologist knows what to look for. Monitoring for sweating, tearing, increases in heart rate, breathing, and blood pressure are much more reliable. Brain monitors may provide other valuable information, so your anesthesiologist may use one, but not to prevent awareness. Why do I have to have general anesthesia for this surgery? Many types of surgery simply cannot be done with other types of anesthesia. Obvious examples are brain and heart operations, but others, such as laparoscopic abdominal surgeries, require more explanation. When you have laparoscopic surgery, the surgeons use skinny tubes with cameras and instruments on the ends to do the operation. This causes less pain than large incisions, but in order to see into the abdominal cavity with cameras, the surgeons need to make room to operate. To do this, they inflate the abdomen with gas, usually carbon dioxide, to create a domed space in which to work. The other types of anesthesia—epidurals and spinals—that used to be used for abdominal surgery just don't cover enough of the abdomen to keep you comfortable. Also, the table is often adjusted into a "head-down" position to improve working conditions even more. The combination of an inflated belly and laying head down makes it very difficult to take deep breaths and keep your oxygen level adequate. With you asleep under general anesthesia, we can use the ventilator to make sure your lungs are fully inflated, making oxygenation easier and safer. Why can't I eat or drink anything after midnight before my surgery? When you go under anesthesia, it's not like normal nighttime sleep. At the point at which you become unconscious, you also lose the protective reflexes that normally keep your airway clear. For example, while awake, if something irritates your vocal cords, they would reflexively close and you would cough to clear the irritant. While unconscious with anesthesia, you may be more prone to regurgitation of stomach contents and your vocal cords and the rest of your throat can't react to prevent the material from entering your windpipe and your lungs. This can lead to a dangerous condition called aspiration pneumonitis or aspiration pneumonia. Damage to or infection of the lungs causes serious complications in some people. So the food and water you have in your stomach could end up in your lungs. While some studies show that the usual eight hour fast before surgery may be overly cautious, and some institutions are shortening the NPO (nil per os, Latin for "nothing by mouth") interval, some will not for another reason: Surgeries sometimes cancel or get moved around. If you are lucky enough to have your surgery moved earlier in the day, but you have eaten within the NPO interval, the operating staff will not be able to move your surgery earlier. And if they move someone else up, you may end up getting delayed even later. Your anesthesiologist may recommend, or give you the option of, spinal anesthesia for your surgery. 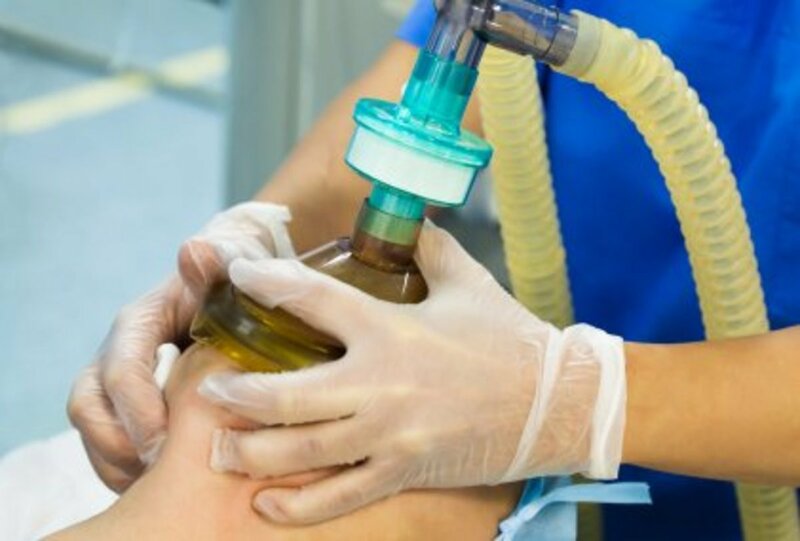 Learn the uses, benefits, and risks of spinal anesthesia. 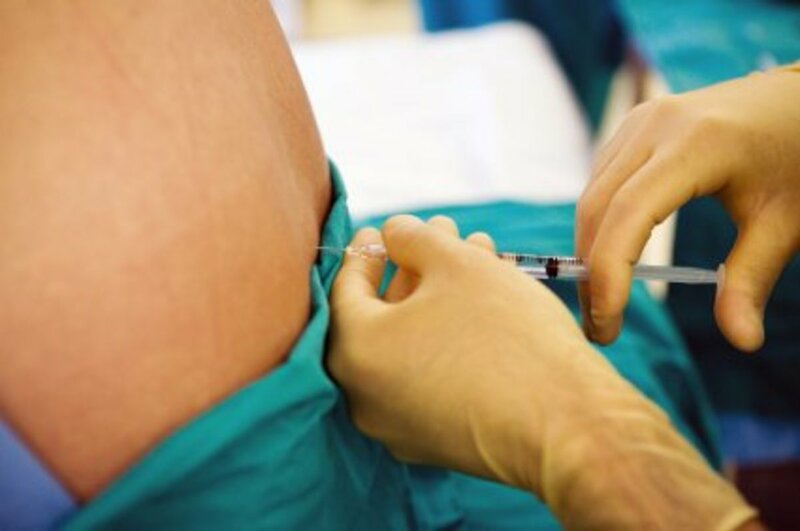 Epidural anesthesia, best know for its role in alleviating labor pains, provides surgical and post-surgical pain relief for other procedures as well. Poll- general anesthesia, use comments to elaborate on complications. Have you had any problems with general anesthesia? Had it once with no problems. Had it many times- no problems. I've had it and had serious complications. Do you have any comments or questions? I will try to answer anesthesia-related questions, but I cannot give medical advice. Am having a melanoma removed from lower back. I am 86 year old male with some memory loss and history od heart problems 17 years ago, Surgeon wants to use general anathesia. Can local be used. am having a Breast augmentation and having GA . I can't lie flat on my back as I get a post nasal drip and it's thick and can wake me up with a start at night coughing. How will my Anastetic doc sort this so I don't choke on the table . I am having a total hip in 2 weeks by the anterior approach. I have 2 herniated discs, can I have a spinal? If so, is an EKG necessary, I'm 65, no heart problems at all. I recently had foot surgery. I’ve have been under anesthesia at least 10 times. This time as the anesthesiologist administered the drugs into my IV I had a horrible taste of like powdered medicine in my mouth that made me start coughing just before I lost consciousness. Why? On opiate pain meds is there a concern I should know about before going under,getting 12 teeth pulled. Also be running out breath , meanings if i carrying a bag or something else to take a breath ? Is it possible to be talking when your under anesthesia? Was given anesthesia before my operation but then woke up realizing I was talking the whole time I was unconscious. I felt very confused. I am having mortons neuroma surgery but I am having bouts of vertigo. Do I need to postpone surgery? I only get vertigo when I first lie down or get up from sleeping. i am due to have kidney removed due to TSS in renal pelvis.This is to be laproscopic. I had quintuple bypass 2 years ago and am fine from that. Since i am 81 and taking the above into account,is there anything i should be aware of prior to surgery.I understand that many inhalation drugs are bad for the liver,kidneys and heart.Do i have to worry? I am 55 and im facing surgery for two hernias,gallbladder and scar tissue removal from the small intestine and i was diagnosed with Mitral Valve Prolasp in 1990 but dont take medication for this dont really have any problems except flutters.My question is how safe is general anesthesia on the heart with Mitral Valve Prolasp im really unhappy about being under general do i have another option? Why it is important to a doctor or nurse to know the percentage of an anesthethic before performing an surgery? Hello. I have a big concern. Please, help me. After 9 days is my operation with full anesthesia, but I started to cough. Some months ago when I went to checking, my doctor said that if I cough they can't do the operation. It was over, but now suddenly I got cold and started to cough. I have to do the operation abroad and at this moment I can't get in touch with the doctor and my flight is in 4 days. Please, help me and advise me what if my cough lightens, as now I take a lot of medicine for recovery, will it be possible to do the operation. And if no, what can be the risks? I had a partial nephrectomy 6 weeks ago to remove a large ( thankfully benign ) tumour ( angiomyolipoma ). I have me/cfs ( chronic fatigue syndrom ) which the anesthetist was aware of . I had a lot of anxiety before the surgery, so the anaesthetist prescribed an ativan tablet pre surgery. I went into the surgery aproximately 8 am and the surgeon tried to call my spouse at aproximately 1:00 ( he'd forgotten to turn his cell back on as not to have on in hospital ). I did not get to my room in the ward until 5:15 pm. My husband kept asking why the delay and nursing staff just said, not to worry she'll be up soon. On my follow up visit to my surgeon I was so worried about the results of pathology I didn't even think to ask about why I was in recovery so long. ( is 4 hours excessively long ? ) I'm wondering if anything went wrong or if there is anything I should be aware of in case of needing anaesthesia in the future. I have suffered shortness of breath but seems to be improving since doing breathing exercises. Three months ago I had a pace maker implanted,now I am experiencing ,an odor in my hair,on my breath ,and my skin has this smell of medicine coming from the pores of my skin.Is this a side effect from anesthesia? Very informative hub. I liked how you explained why laparascopies are done under general anesthesia, even for surgeries performed below the belly button. I cannot say I feel at ease about general anesthesia, and will probably do whatever I can to avoid it, but it certainly helps to have an idea as to what to expect, coming from a professional. To be a soccer mom is equivalent to having some sort of part-time job that has a demanding program. My top ten soccer mama ideas will probably hopefully be useful for finding balance that you saw and while doing so help improve your son or daughter's soccer ability. So I had a lump removed from my breast under General anaesthetic four days ago, not sure what pain killers I had but I know they put some in me before they put the anaesthetic in. Ever since I have random spurts of itching which is mostly down the arm that I had the anaesthetic put in and my legs (still wearing the stockings they give you for blood clots) and also my face. I was wondering when will this stop it is very irritating. I have also got this mucus cough after I eat :/ never had it before but I have to cough til the mucus has gone for it to stop. Is this normal? Hello I had surgery 2 days ago and quite traumatised by it all..my first conscious memory was the nurse advising me I need oxygen through my nose as my oxygen levels were low. .also my blood pressure..they took me to the ward after recovery ward and I still was out to it..some 6 hours later the nurse tried to take me to the toilet but i could barely walk and felt so dizzy I felt like I was going to pass out..I didnt wake up properly till 1am that morning and my surgery had been 1pm that day my blood pressure was still down the whole day..ive had surgeries before and it never took me that long before. I have to have a complete hysterectomy 8-30. I just had a D@C and was put to sleep the middle of last month. I have Meniere's disease and since the last surgery my dizziness has gotten worse. Do you think the next surgery will add to this? How save is it to have 2 in a month and half? Is thrashing around a side effect of Propoful...I had a follow up colonoscopy and was told by nurse after awakening from anesthesia. I did not have this reaction 3 months earlier under the same anesthetic. Is this a common reaction. Very good information! About ten years ago I had a cesarean under anesthesia. My husband did not tell me until later (he forgot in the excitement of the baby) that they had been very scared for a while because a nurse came out and told my family they were having a hard time getting me out of anesthesia. I remember waking up in extreme pain and the staff seemed very frantic... The staff never explained what happened & I have always wondered if I should get my medical records from that hospital (I have since moved states) in case I have to go under again & they should know about the possible? Complications. Is this common & what are the possible causes? Yesterday was my surgey! I am doing well resting at home. I just wanted to say thank you for your response and all your information. I was given versed, I guess something to take the edge off, right before heading into the operating room. Once there I guess I was given proforol through an IV and I could hear someone say you will get very sleepy soon and next thing I knew I was being awaken by a nurse asking me if I was in any pain. The surgery was over! It was as though I had closed my eyes for 5 seconds! Again Thank you! Thank you so much for posting this blog. I'm getting ready to have my very first surgery ( a tonsillectomy) at the age of 25 and I am petrified. I know in the grand scheme of things, it's a very simple procedure, but like you mentioned, it's the fear of the anesthesia that gets to me. I don't like the fact that for those 45 ish minutes, I will be giving all control up to a stranger (a very very educated and smart stranger, but still a stranger). I do get panic attacks prior to anything very stressful....is there something they could give me to calm me down before surgery and/or make me not aware that I'm going into the OR? I'm perfectly healthy (the sickest I've ever been in my life was just the stomach virus). Everyone in my family has had some kind of surgery with some type of anesthesia and no one has ever had any problems. Based on that, are the chances pretty good that I too won't have any problems with the anesthesia? Sorry for all of the questions- I'm just really nervous and am trying to get as much information as possible. Thank you so much for your reply. I did ask if an epidural or other local anesthesia would be an option for me and the answer was no. The surgery requires GA. Uncomfortable and I will need breathing tube. I am still apprehensive about it all but I am slowly coming around to the idea that all will be well. Will keep you and your readers posted! The fear of general anesthesia is not easy to overcome. So I know I am not alone in this. Again Thank you. I have been both a patient and a doctor with anesthesia. I honestly believe the best thing is usually to go with the 'norm'- what the doctors and nurses are most used to doing for a particular procedure. In this case, that is going to be general anesthesia. Laparoscopy has been done with epidural on very rare occasions when there was an overwhelming reason (like medical issues that made general anesthesia unsafe) BUT it is NOT ideal. It is very difficult to get the epidural to cover / prevent pain in all of the areas needed for a laparoscopic surgery. I would not advise it as a doctor, nor would I accept it as a patient. While the surgery will not take long, it would still be quite uncomfortable due to the gas that has to be put into the abdomen and the position in which you have to lay while they are operating. General anesthesia does a much better job of this. You can ask to speak to someone from the Anesthesia department there long before your surgery to get more info. It will likely help you feel better. General anesthesia is more scary because you have to give up control to become unconscious- you are not aware of what is going on, but in this case, I believe the discomfort and the risk to you and the level of difficulty for the surgeons are all minimized by general anesthesia. You could ask your doctor about the possibility of doing something to avoid general anesthesia, but I imagine you will get a similar answer. I have had 5 surgeries, all with general anesthesia. I also have young children (I had a 4 month old baby when I had my 1st surgery) and it's a protective momma instinct to fear that you won't be able to care for them, but if you are otherwise healthy, general anesthesia should be very safe. Hi I am scheduled to have a laparoscopy sterilization in about a month. I was told I will need GA for it and the operation should not take long. I have never had surgery or needed to be put under and it's scaring me to think something will go wrong like feeling everything and being in pain and not being able to let people know the state of pain I am in. Also the thought of not coming back from it is scary mostly cause I have children to care for. So my question is how safe is GA? And would an epidural be a better option? Cause I had an epidural for my last birth and I tolerated it well I think. I feel there would be less complications with an epidural for this particular surgery. But I'm no expert. Thank you for taking the time to answer questions. An isolated blood sugar near the high end of normal should not be a problem. If other issues are discovered or suspected, that could be an issue, but unlikely. Of course, without reviewing your history thoroughly, knowing the details of the surgery you are having, and the reason for it, doing a physical exam and seeing other results (like EKG or other labs), I cannot possibly say what will happen. Hi, I have a somewhat elective surgery coming up and my baseline labs came back normal except my blood sugar was 104 after fasting. This is kind of typical for me to be right over the cut-off of 100. Will this prevent me from having surger in 3 days? I had thorasic surgery to repair my esophagus after suffering from Barrets Esophagus! They took half of my stomach to make a new esophagus. I have had pain ever since my surgery, They took me off of my fentenyl Patch that I was on for cluster headaches. I am now on Luricol! That isn't working for the pain. They put a shunt in the bottom of my stomach thinking if the food can get to the bowel quicker then the pain would stop! it hasn't and now I have to go under again to have shunt taken out!!! Do you have any idea on what to do about the pain?? I'm not sure I understand the timing of the events. I think you are saying that you had a seizure 7 days after surgery? In that case, it wouldn't likely be related unless you never went back on your xanax and you were taking that for seizure suppression? I'm sorry I cannot help, but I don't understand what you are asking. Doctors- especially those who cannot examine and talk with you- simply cannot make guarantees. In my experience, in tens of thousands of patients, I have never had a patient have a problem under anesthesia that was caused solely by menopausal hot flashes, so assuming the hot flashes are menopause, it won't likely cause a problem. It is a normal physiologic change that we are aware of. That's the best I can do without knowing/seeing/talking with/examining you. Please express your concerns to your doctor for further reassurance. Thanks for quick response. Your answer "will almost certainly not be a problem" makes me more concerned.. Does it mean the anesthesia is more challenging hance more prone to complication? I hope you can give me a more "reassuring" explanation. Thanks a bunch! Anesthesiologists often give anesthesia to perimenopausal women. Just tell your anesthesia provider your concerns beforehand. It will almost certainly not be a problem. Hi very informative page. I'm going to have a surgery. am in my fifties and suffer from hot flushes. I was wondering what happens if I get a hot flush during the surgery. Would it confuse the monitor/ vitals while I get hot and sweat etc ? My best guess (and it IS a guess ONLY, not a diagnosis, recommendation or knowledge of this specific case) based on what you told me is the cirrhosis of the liver. The death rate for people who have advanced cirrhosis and anesthesia/surgery is very, very high. It can be in the 20 to 25% percent range shortly after surgery and much higher ultimately as a result of related complications. If she has cirrhosis badly enough to have varices and bleed easily, she has advanced liver disease and she would be at extremely high risk- a one in five to one in four chance of dying and would almost certainly have other complications short of that. "Identification of the surgical risk is imperative in the care of any patient, especially as patients develop an increasing number of chronic comorbid medical conditions. Patients with liver disease are at particularly high risk for morbidity and mortality in the postoperative period due to both the stress of surgery and the effects of general anesthesia. del Olmo et al compared 135 patients with cirrhosis with 86 patients without cirrhosis, all undergoing nonhepatic general surgery. At 1 month, mortality rates were 16.3% for patients with cirrhosis compared with 3.5% in the control group. What is further evident in the literature is that decompensated liver disease increases the risk of postoperative complications (eg, acute hepatic failure, infections including sepsis, bleeding, poor wound healing, and renal dysfunction). 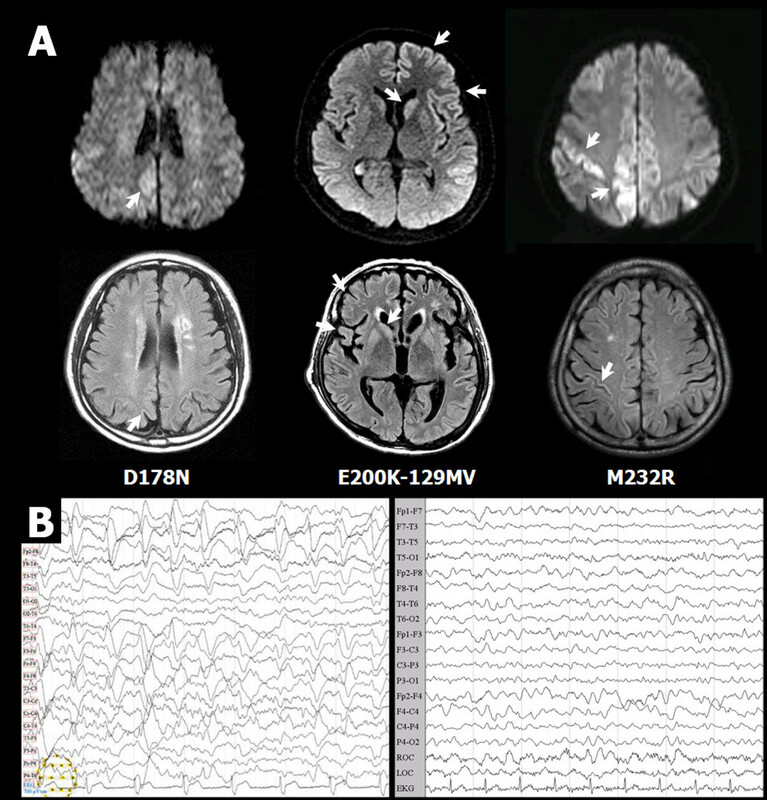 Assessing risk in these patients is a challenging but important endeavor." So... the only thing you can do is ask for a surgeon and anesthesiologist's opinion at an academic or large medical center where they have high-level liver specialists and excellent ICU care if she really has advanced liver disease. If she has other conditions like kidney problems, heart issues and so on, it's going to be even more difficult to find someone willing to put her through this risk when the surgeons say they can do this with local anesthesia. Good luck. It's a tough situation for sure. I hope that you at least get a better explanation and another opinion. But, you will need to seek out a medical center with the right expertise to even give you the best assessment. QUESTION- why would my mother who has skin cancer of her nose be denied general anesthesia, when this surgery due to the depth of cancer and cosmetic repair needed after? She is refusing to have it done w local and they're concerned with her health (current medical and mental state) and refusing anesthesia. Without my mom getting clear answers everything's come to a halt which concerns me. The cancer has already tore her nostril in two which she experiences Constant bleeding and uses toilet paper to hold and cover nostril. This is ridiculous. She was diagnosed w beginnings of dementia however not incompetent. She can refuse surgery although if they deem her unable to make this decision it'll fall on me, next of kin, as our mom is not married. She also has cirrhosis of the liver. However her GI doctor has claimed she has a normal endoscopy, her varicies (spelling) found last upper endo are now gone (questionable. Read they move but don't disappear). Nevertheless not concerned and claims blood work normal. Mom hearing this and us too would therefore be confused than why surgeons are not willing to put her under knowing how firm she stands be this request believing its her right as well. Does not wanna be awake for this kind of surgery which first is removing the cancer from nose and they won't know how much but do know by visual damage now, they'll need to Repair nose cosmetically using cheek skin ? Can anyone medically educated tell me who they refuse or why they'd refuse to put someone under knowing this is a surgery they have and normally would put one under for? Help me understand as I was not able to join her at the consult. But surgeons won't budge. Local only and she's insisting we keep looking till we find a surgeon that'll put her out. She's 67. My grandmom had surgery under anesthesia at age 86 so I know it's not because of her age. Thanks for any insight as they have been vague. Simply are not happy with her general health mentally or physically. No specifics. Have you had it worked up? If not, mention it to your doctor. They can evaluate whether or not you need further testing. Is it a feeling you have or have the nurses mentioned it to you? Does it happen any other time or only after surgery? There are a couple medicines that anesthesiologists use that can speed up your heart rate. One is a med we use to keep your blood pressure from dropping or to treat it if it does. Another is medicine that goes along with the med we use to reverse the muscle relaxation. In addition, demerol, a medicine used for pain and shivering can cause increased heart rate in recovery. Pain, the excitatory phase of waking up and medicines can cause this. Knowing what meds you take, your medical history, whether it happens any other time, any other symptoms, and so on and so on are only a few bits of the history it would take to know for sure why this has happened. A tummy tuck is actually a pretty big surgery with a significant recovery, so you want to sort this out first. After having two surgeries I noticed once I'm in recovering I start getting rapid heart beat that last for about a minute or so. This happens for a few hours. I've been thing about getting a tummy tuck but afraid of this happening again. One of the big outcomes studies/databases ACS-NSQIP (American College of Surgeons-National Surgical Quality Improvement Program) did find a correlation between preoperative anemia and postop complications. This was more pronounced in patients with anemia and comorbid conditions such as heart or lung disease. Unfortunately, I don't know what all of the confounding variables were and whether it had to do with receiving intraop blood products because of a lower threshold to transfuse or whether all surgical types were included. I approach anemia like this. If there is time before your surgery, make sure your primary doctor and surgeon know. Adjust iron supplements or take other measures to increase the red blood cell number prior to surgery. If the surgery is major and blood loss potentially requiring transfusion is likely, I will be more aggressive in my preoperative stance that anemia needs attention prior to surgery. 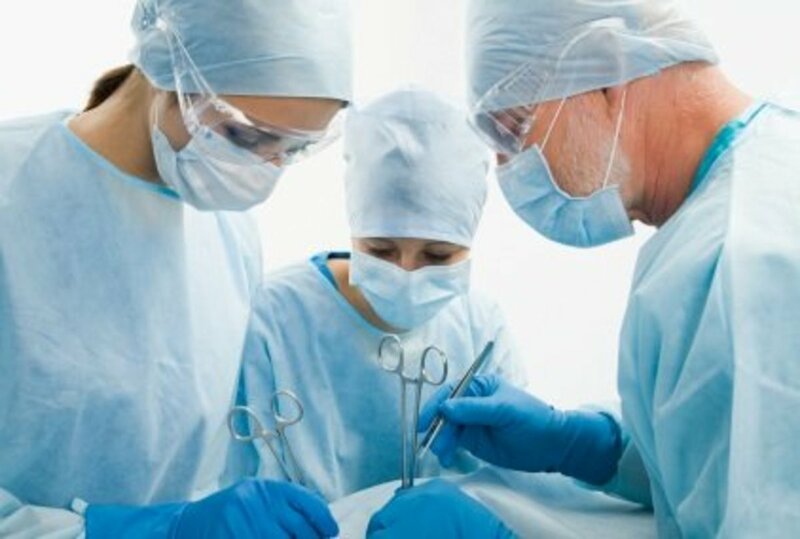 If the surgery is not expected to require transfusion or if other medical conditions are not present, or the level of anemia is mild or if there is no time to get medical attention for the problem (urgent or emergent surgery), then I make sure the patient and surgeon understand the risk and proceed with caution. Another quick question: Is there any risk correlated with being anemic (caused by low iron) and general anesthesia? I was recently diagnosed with GERDs and a hiatal hernia. I was wondering what are the risks with these two conditions and general anesthesia. Just would like to be prepared for when my next surgery gets scheduled (unrelated to these two conditions). If you have a fever, a history of asthma, are coughing up any sputum or have other medical problems, then they may very well want an xray. But, since all institutions doctors are different, please call your surgeon's office and ask. If you have an anesthesia preop clinic, that would be an even better place to get the answer. Express your concern and that you are just trying to make sure you won't have any issues the day of surgery that might risk cancelation. Good job trying to be ahead of the game. It's good to be proactive. Thank you so much, put my mind at ease, iv'e waited a long time for this surgery and i dont want to cancel, nor do i want to cough! Do you think i should go take a chest xray, for them? The cough reflex is suppressed while under general anesthesia. Again, it is possible to cough while going to sleep and waking up, so tell your anesthesiologist if you are having cough. Usually, the meds will prevent this, as well. Smokers tend to cough more during these times than others. If you have allergies/post-nasal drip or something like that, it usually isn't an issue at all, even before and after anesthesia/surgery. Asthma and smoking are more likely to cause coughing, wheezing and low oxygen levels. Even in these populations, it is rare for it to be enough of an issue to warrant intervention beyond maybe an inhaled treatment or a little extra oxygen for a while in recovery. Hi Patty, if you are under general anesthesia, your cough reflex is suppressed and you do not cough from allergies. It is possible to cough when going to sleep and waking up and there might be an exacerbation of coughing for a short time after the surgery. Usually, that is the propofol (occasionally another induction drug) that burns if it happened right as you were going to sleep. Tell them next time that you had severe pain and you remember it and see if they can put some medicine in before the propofol to numb the vein or make it so you don't stay awake long enough to feel it. Some places/anesthesiologists can do that and some can't/don't for a variety of reasons. Good luck- hope you don't need more surgery, but if you do, I hope this helps. I had lower back surgery on May 6th and when I was put to sleep under general anesthesia the pain in my IV and up my arm was excruciatingly painful. I screamed bloody murder and I have never done that before. Thank God it was only momentarily and the next thing I remember was waking up in the recovery room. I have had 10 + surgeries in my lifetime and never had that happen before. As a matter of act I am always so relaxed that the doctors usually comment and joke with me prior to putting me to sleep. This is the first time I have had a surgery at this facility and I spoke to a friend who also just had surgery there and had the same painful experience. What would cause that? Unfortunately, I will be scared to death the next time I have to be put under or anything! You need to tell your doctor and right away. The issue may be more surgical than anesthetic. This isn't my area of expertise but, the changes in hormones can change things like your risk of bleeding and affect your healing. But the GYN doctor will know if this is still going to affect you at the time of your surgery. I'm sorry you are having a hard time, but tell your doctor right away! Don't wait till the day of surgery. Call the office in the morning. Good luck to you with everything. I have endometriosis and am undergoing exploratory surgery in 11 days. My doctor told me not to mess with my hormones and I assumed it was because it will mess with the general anesthesia. Unfortunately, I had to take a Plan B pill today which I just read is significantly throwing off my hormone levels. Should I be concerned? Should I tell my doctor that I took Plan B or will my hormones reset by my surgery? Usually the necessity of surgery overrides any potential issues with repeated general anesthesia. Most adults are ok with anesthesia as you describe. Older people, people with serious health problems or pre-existing dementia and children may have more issues with frequent, repeated anesthetics. I bet you are going to feel tired and worn out for a while as your body tries to recover from all that, though! tahoedoc, hope you're still around...I have a question about how many times within 6 months is it safe to go under anesthesia? I have had bariatric surgery with complications and have had to have several procedures and possibly surgery again on Tuesday...this will be a total of 6 times in less than 6 months! As with most things, knowledge is power. If the anesthesiologist knows you have that history, they can prepare for it. I've had 2 patients in the last 2 weeks with a history of SVT. One had a brief, self-limted run under anesthesia and the other was already on medication and had heart rates that stayed under 80 the whole time. The stress of surgery on the body, the physiologic changes of the pre-existing illness and the general anesthetic can trigger rounds of SVT. It is usually pretty easily controlled or treated though and almost never causes a problem, especially in a younger person who doesn't have other heart disease. Just be sure to tell the anesthesiologist. They can decide, based on your vital signs at the time and other factors, whether to pre-treat or just be on the lookout for it. You are on a heart (and other) monitor the whole time and the anesthesiologist is there the whole time, so if there is an indication of SVT, they can and will respond quickly. Good luck! I bet you do great. @Manhattanbeach3==Hey there- sorry I missed this. I have done GA for these surgeries. The neurontin will be fine at the dosages you mention. The other changes in narcotic pain meds seems like personal preference or practice of the surgeon? maybe. Unfortunately, I don't know what is routinely done in the months up to the surgery. I cannot say I specifically have heard about these types of reductions or changes, but I only see what patients are taking right before the surgery. It seems (although I have no idea if I am correct) that the surgeon or whoever is managing this is trying to get you on the lowest effective dose of narcotics so that pain medications will be effective for you postoperatively. Norco is less potent than percoset, although they are both narcotic/acetominophen combos. The nucynta is another narcotic. If you are on strong pain meds before surgery, pain management (and to a smaller degree, your GA) will be MUCH more challenging. This is a big surgery with a significant recovery. Postoperatively, there will be fewer choices and less likelihood of success in treating your pain if your body is already accustomed to or dependent on, the strong narcotics that are routinely used for postoperative pain. That's my best guess as to why this is being done- to minimize the preop amount and strength of narcotics, to maximize success of pain relief after the surgery.. I'm surprised your doctor did not give you an explanation for such changes in your regimen. And, again, I'm sorry I missed this post before. Some times are much busier with hospital work and I can't always guarantee an answer at all or in a timely manner. Thanks for the reminder to get back to this! Good luck to you and if you have other questions, I will do my best to respond. Hi, just wondering if you would have time to respond to my post about back surgery from 3 months ago. Thanks!! Great Hub. I am an RN and enjoyed this a great deal. Voted up. Thank you so much for such an informative answer and so quickly, too! I feel more confident discussing this issue and my options now. I hope I won't run into the preop area and start yelling for them to load me up with everything in the arsenal. Too much could be counterproductive. I also checked out your other excellent page. Thank you for not simply replying, "go read this so I don't have to repeat myself." It may not seem like a huge deal to you, but this has helped me tremendously. Hi HSMom. You are articulate and knowledgeable and that will come through when you talk to the anesthesiologist. Explain that not only do you have a history of postoperative nausea and vomiting, but that you are also emetophobic (just the use of that word will get their attention- in a good way). Hydrate well up until the point that you are to take nothing by mouth. Tell everyone you talk to (surgeon, anesthesia office, preop nurse, anesthesiologist, etc) that you need meds to help prevent nausea. Scopolamine patches can be very, very helpful, especially if you have a history of motion sickness. Usually, the nurse in preop will apply this before you go to surgery since it takes a couple hours to kick in. This is good for people who are going home. By the time the IV meds are wearing off, this thing is kicking in. There can be some rebound nausea for some people when it is removed a couple days later, but no where near the anesthesia and surgery related nausea and vomiting. The other meds are IV while you are at the hospital. Before or during surgery, the anesthesiologist can give you metoclopramide (Reglan), ondansetron or decadron (a steroid) to help prevent post op nausea and vomiting. Most useful intraop or in recovery are phenergan and ondansetron (in my experience as a patient and doctor). There is an orally dissolving tablet (ODT) of ondansetron (Zofran) that can be helpful. If you take it with pain meds, it can prevent nausea that comes from them too. As a patient, I usually get prescriptions for both the Zofran ODT and pherergan. One or the other, or the combo tends to work very well. I also recommend that patients ask their surgeons to prescribe those things along with any pain meds or antibiotics. They are usually happy to oblige as it may prevent them from trying to figure out how to treat your nausea in the middle of the night. Good luck and check out https://healthproadvice.com/procedures/PONV-Post-O... if you haven't already. And of course, all of these meds have side effects and potential interactions with other meds or medical conditions, so your anesthesiologist will make the decision about which are most appropriate after reviewing your history. Hello TahoeDoc, thank you so much for making yourself available in the comments section for questions. I am preparing to schedule an elective lap cholecystectomy. I have little fear of going under anesthesia or of any recovery complications. Unfortunately, I am a lifelong emetophobic. I would prefer to wake up in recovery and hear "Well, we accidentally lopped off a hand," than to wake up nauseated and/or vomiting. I'm sure you must hear this concern from every patient, but my fears go well beyond the standard worry. It's actually making me hesitate to have the surgery done. I received what was called "general" anesthesia for wisdom tooth removal when I was 20 (25 years ago) but I'm sure it was actually conscious sedation since no oxygen support was required, etc. When I awakened, the nurse asked me if I felt nauseated and I said, "nope" and then heaved into a trash can. I honestly didn't have a sensation of nausea - it was more of a dizziness and "motion sickness" feeling. I threw up again after coming back home and then I was fine. Are the effects of GA similar and is there anything at all that can be done to help prevent this? Thank you so, so much. Of course I will talk to whoever is doing my anesthesia, but with only a few minutes to talk beforehand, I'm not sure I will be able to adequately explain my outright terror without it seeming to be just preop nerves. It would be great to be able to speak intelligently about what measures could possibly be taken. Hi Scardykat. The OTC nasal sprays (I'm guessing you mean the ones with phenylephrine and not the saline ones) cause constriction of blood vessels and thereby decrease mucous congestion. They can cause some systemic effects, but usually not enough to cause problems under anesthesia. In fact, we use phenylephrine nasal spray in patients when we have to place the breathing tube in the nose instead of the mouth (the usual entry) to constrict blood vessels and decrease the risk of bleeding. Incidentally, stopping those sprays cause a rebound congestion. That is why so many people become dependent on them. All you really need to do is tell the preop nurses and anesthesiologist that you have been using these. If possible, do this when you do your initial preop interview. The anesthesia providers should be aware that there may be some effects on the mucous membranes of the nose and maybe (although not so likely to be significant) on the mouth and throat. Rarely, someone is sensitive enough and absorbs enough to cause an increase in blood pressure, but this too, is usually not a major issue unless you have other health problems or take lots of other medications. Seriously, if you tell them, that's usually all the preparation required. Hi, great information here, thank u! I'm a nurse and really appreciate your feedback! So I'm going to have back surgery in a couple months, an anterior lumbar fusion at L5S1. 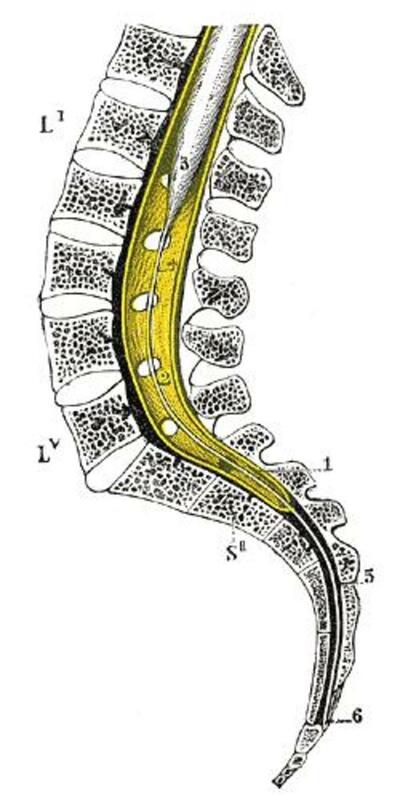 Degenerative disc and herniation. I've been taking pain meds for a year now: nucynta er 50-150 mg bid, currently 150mg bid, Tylenol 500 mg bc I get headaches from the nucynta ER, Percocet 5-325 mg as needed for pain, flexeril 10mg prn, neurotin 200-300mg tid. Now my dr is telling me I have to detox off all of my pain meds before surgery. He said that I will have a higher success rate with the surgery if I am off my pain meds. Can you explain the reasoning in detail for this? What are the benefits of being off all my meds? Leading up to surgery, I will be in a lot of pain and won't be able to take anything. I'm willing to do whatever I need to to have the best chance of a successful fusion, I would just like to know the "why"? So right now, as dr ordered, I've increased my neurotin dose to 400mg tid, and decreased nucynta to 100mg bid, Tylenol 500mg daily, and added Celebrex 200mg daily. Then he said I can take Norco 10-325mg prn, max of 3 doses in a day. What are the reasons why norco is a better pain med to take before having surgery than Percocet? He does not want me taking any more Percocet. Please explain. Then after 2 weeks I will decrease nucynta to 100mg day then 50 mg at night, and slowly keep decreasing pain meds until surgery date. If I have taken pain meds for a year, does it make GA more difficult? I'm 27 and healthy otherwise, healthy wt. Have you done GA for ALIF's? Difficult procedure? Thanks for your feedback! Really appreciate it! My main concerns are to know the benefits of being off pain meds before surgery, will it make the surgery and recovery more successful, why norco over Percocet, and does taking a higher dose of neurotin have any effect on GA/surgery, and any other comments you have about my situation. Thanks so much! Not perfect, but vigilant and conscientious. I try anyway. Thank you. I have learned a lot just reading this site. I'm a 40-year old guy who just returned from the middle east; unfortunatelly I returned with a few extra grams of metal (fragments of anti-aircraft artillery) that were lodged in my arm during my last flight..no big deal, just some metal slivers that need to be removed and I wanted to have them removed back in the USA, not at a field hospital thousands of miles from home. I'm a pilot, not a doctor, so my comments are not medically sophisticated...my degree is in aeronautical engineering, not medicine. Anyway, upon returing to the good old USA, I seek out a surgeon to remove the copper/steel splinters from my forearm..no problem, she's a great surgeon and I trust her judgement when she says that a general anesthetic is necessary; I certianly would prefer to avoid GA, but she assures me that the anesthesiologist that she works with is experienecd and safe. On the day of surgery, I am interviewed bt several "providers", none of which are an anesthesiologist. I get prepped and the IV is started etc, and I'm asked to sign a blanket consent for "anesthesia care providers" to perform my anesthesia and a friendly nurse-anesthetist keeps telling me that she will "take great care of me, just sign this consent and I'll kepp you comfortable, safe and warm". She has a fit when I tell her that my GA will be administered by an anesthesiologist, not a nurse (CRNA) as promised by my surgeon. This CRNA has a meltdown and tells me that she's "equivilent" to any anesthesiologist, etc and suggests that I sign the consent immediately. I decline; Ihave never refused to do anything that any of my doctors have asked me to do, but this is plain stupid: I was told that an anesthesiologist would perform my case and now I'm expected to accept a nurse CRNA at the last minute, and I politely decline. As I'm getting dressed, the CRNA is still arguing with me, until she notices my wounds, then she starts to apologize and starts to tell me that she supports "America's heros who defend us"..I tell her that I'm no hero, just an airline pilot who was temporarily assigned to combat duty "over there"....after all that I went thru, I don;t want to return to the USA for surgery and die on the table because I didn't have an anesthesiologist performing my case. The CRNA left the room but soon retuened with the much-promised anesthesiologist, who seemed unhappy that she had brought him in to talk to me. I asked him if he would be personally be performing my case as promised by my surgeon; he spent 20 minuted not answering that question, but finally agreed that he would personally do my case. Fine. But when I specified this on the anesthesia consent and asked him to sign it, he balked: " everyone gets a CRNA, I'll be supervising your case, don't worry". At this point, my surgeon and the CRNA spoke and said: "he was promised an anesthesiologist performing his case 1:1. why are trying to get him to accept anything less"? At this point I gave up and got dressed. When did anesthesia become a nurse's job? The kicker: "you have to sign a consent so that the CRNA and everone else will get paid"..I'm glad that I didn't sign anything. I'll never consent to anesthesia of any kind unless it's administered by an anesthesiologist The copper fragments in my arm are turning s pretty green; I'm sure that this woukd be funny to the CRNA . Experienced patient's comments are spot on. I have a D.O. degree, vrefentialed in anesthesia and I want a physician administering any and all of my "anesthesia care"
Good and helpful article. Anesthesia care has reached a point where it is no longer safe or in any way routine. I have great insurance (plus a medical degree) and it's not the science of anesthesia that scares me, it's the medical economics that puts profit ahead of patient safety..I'm speaking of the ACT care model (anesthesia care team)...basically a patient's anesthesia is done by a CRNA- a nurse with maybe 20 months of nursing school "anesthetist" training; note that they are not an anesthesiologist in any way, shape of form. but to maximize profits, many institutions allow these nurses, and they are nurses, to be sure,to attempt to function as anesthesiologists......sure, one anesthesiologist may (or may not) be present to manage up to 4 of these nurse/CRNA's, but basically a patient's anesthesia is done by a CRNA (a nurse, not an anesthesiologist)..this is unsafe......hey, if you want safets, insist that an anesthesiologist actually personally perform your case, not supervising multiple CRNA..what happens whn 2 (or more emergencies occur when 1 anesthesiologist is supervising 4 nurses?CRNA? answer: one patient gets the services of the anesthesiologist and the other gets a nurse...for hevan's sake, I never want to be the poor patient depending on a nurse (yes, all CRNA are nurses, nothing more or less) to handle my anesthetic emergency. And a mom as well. Thank you for sharing with us. You are a brave and patient person! I am in awe of anyone willing to be an anesthesiologist! How does one happen to have the dedication and guts??? I would be so afraid of miscalculating and making a mistake. I would be ner- ner- n e r v o u s.
You are welcome, Lisa. If it was my child, I would certainly prefer an earlier time. So, if you can get it, that's great. Don't cancel the spot you have until you see if you can be moved earlier. If not, though, then could you see how he's doing that morning? If you get concerned that he is too distraught, then you can reevaluate at that point. Since you will be at the hospital early, you will have nurses and the anesthesia staff that can help you decide if his level of distress is too much to proceed with surgery. I have never seen a child be so upset that we couldn't proceed, but I don't work with a high volume of children or at a Children's hospital, either so I may not be a good measure. I totally get what you are saying and your concerns are certainly valid. He's just too young to understand the "rules" or why he can't eat, I understand how that can be with a little one. I wish I could help more and hope this works out for you. I try to check this page every day or two so don't hesitate to come back if you have other questions or concerns. Thank you very much for those strong words of encouragement and reassurance of the best practice. He normally wakes around 7am, immediately nurses for 30min, then breakfast at 8am (oatmeal, yoghurt, hardboiled egg, applesauce), then nurses before morning nap at 10:30am for 15 min, then wakes at noon and has a big lunch at 12:30p! So we know this is going to be very hard as not only will he be hungry, but he'll also probably be exhausted as I'm not sure that we'll be able to get him to nap without having nursed or fed. I like your ideas for distraction, I was also thinking to get him a kid's laptop computer (he goes bonkers for electronics despite his parents owning a wooden toy store, go figure ; ) for the hospital wants us to be there at 9am. If you don't mind, just one more question, based on that he'll likely also miss his morning nap, and be so hungry (we're just plain not able to get him to sleep when he's hungry, he's always been like that), if he becomes so upset that he's screaming, crying, purple for hours, then is there a level of stress on his part where it becomes harmful to go into surgery so worked up? I agree with you that he will need me to be a calm collected reassuring touchpoint that morning. Thanks for that. I just still wonder if I should persevere at the hospital to try and find some way for us to get this done at an 8am surgery time. It may be the case that I can but with a different dental surgeon. 1) I know this is stressful. My child had surgery when he was 19 months old, so I get it from the mommy's point of view too. BUT, the most important thing for you to remember is that this will be a passing event in your baby's life that he will not remember. It is waaaay more traumatic for you than him. Deep breaths and keep in mind that your stress level will affect his behavior. 2) None of your concerns seem trivial. This is your baby and your instinct is to protect him from anything unpleasant. Good job. Having said that, please follow the instructions as given. Even if it's not harmful, and there may be some debate, it will add stress to the operating room team. It makes them wonder if there were other rules that were broken or bent. I know some anesthesiologists because of this doubt would consider canceling the surgery that day if you showed up and told them he had beef broth or something else not pre-approved. Trust in the doctor-patient relationship works both ways. 3) It is not going to be the best day of either of your lives. Just accept that this is going to be a hard day. Accept it, be tough and get through it. I don't mean that to be callous, but it will pass. If this is the best decision (and it sounds like it is), the hardships of one day are usually worth the payoff. Does that make sense? I hope that comes across with the tone of caring that I mean for it to. You already know, as a parent, that enduring unpleasantness is just part of our deal. He will not remember this. My child was exactly back to normal by the next day. What I would do: Give him his juice, water, ginger ale up to 9am as indicated. If the surgery is at noon, they will likely want you at the hospital between 10 and 11am. That gives you just an hour or two to kill before all the helpful distractions of the hospital. Take him to a park or movie or just drive around- whatever is unusual and new to distract him. Many kids can get lost in a show on a computer or iPhone or iPad while driving around. The key will be to get him out of the house where he normally has access to food and distract, distract, distract. Some parents keep the kids up later the night before so they may nap and pass some time until the surgery. Other parents know this makes their child too cranky- your call on that one. You WILL get through this ((hug)), really, you will. If this is going to be better in the long-term (and that's between you and the dentist), then just soldier through the short-term unpleasantness. You can do it! Oh, and one more thing. If it were my child, I'd rather have them anesthetized by a pediatric anesthesiologist at a Children's hospital, than sedated in a dental chair to have 4 teeth extracted. He'd probably need a lot of sedation to get through that anyway. The risks may be higher. Just my opinion and no offense to the dentists, but if given the choice, I'd take the hospital with a designated (pediatric) anesthesiologist. Please keep in touch. Let me know if you have other questions and let me what you decide and how it goes. Good luck sweetie. I'm so glad to have found you, with such clear and compassionate responses, I feel safe asking you about my 15 month old's upcoming GA. We have an alternative to the GA for dental work - to simply have his 4 top front teeth extracted, in which case the permanent teeth won't come in til he's ~7 years old. We decided on the GA, due to the myriad very good reasons to avoid extraction. I had prepared myself with knowledge of the very low risks, and secure in that it would be done at the Children's Hospital of Eastern Ontario, Canada. A dentist at my son's clinic was able to get him in on his surgery date a month from now, which means that we don't have to wait potentially another 8-10 months on the waiting list for the general anesthetic, by which time the teeth might not be able to be saved as the cavities may be too big. We know that we're very fortunate, and being at CHEO for the consult this week, we were ever-mindful of the more serious circumstances that other children were there for. However, at the consult, they told us that the surgery wouldn't be til 12pm. Which means of course, no breastmilk or food or non-clear liquids after midnight the night before, and no water or anything at all after 9am. My son is and always has been a big feeder. I know all babies are, but I know other babies well, and he just seems to have a fast metabolism. He's pretty good-natured and calm. He even lets the dentist look in his mouth sometimes without resistance. However, when it comes to going without food for so long, I know from experience that he'll be screaming, heaving crying, and inconsolable that morning for hours before going in. I've read that a little stress can even be healthy pre-surgery? But I know that this will be A LOT of stress. I know it may seem trivial. The nurse at the consult didn't exactly gloss over him going without food or drink that morning, but she said a more compromised patient had to go first that morning. I just can't believe that I am doing right by my son to put him in this situation. He'll go into the surgery completely spent and exhausted, angry & upset for hours. I mean, really screaming at the top of his lungs, turning purple, angry and upset. This can't be good for his body, already going into the stresses of surgery. I asked the nurse what is included in 'clear liquids' which he can have from midnight to 9am that day, and she said only apple juice, water, and gingerale. I asked if I could give him beef broth, for some more sustenance, if I made it from only lean meat, carrots, parsnips, and ginger (nothing too gassy to upset his stomach), but then strained it a hundred times with the finest mesh I could to get all of the particulate out. She advised against this, as she said it's not on the list. I read here on your site and I understand the risks of him throwing up and it entering his lungs. I certainly don't want to do anything that would be dangerous. Is it particulate matter of even the finest size that is of concern? Anyways, the clear beef broth question is a side question. The bigger one is about the effects of such stress of not eating or drinking til noon on a baby his age before the surgery. I know it seems trivial, but I can't believe that it is. Should I not be trying as hard as I can to get him an 8am surgery time? Or is it wrong to vie for this, when there are so many other children with more compromised situations? Thank you very much. Your comments will be extremely appreciated. As a parent, and as a parent of a child who's had GA, and as an anesthesiologist, would you simply have your child's teeth pulled rather than put his little body through all of this? Kim, I really hope that helps you feel better. The reason propofol gets a bad rap has to do with 1) Michael Jackson's doctor trying to use it for a sleep aid- completely inappropriate and dangerous without oxygen and monitoring available. 2) the use in health care certain settings without qualified people there to give and monitor it. This isn't as common anymore since the standard of care is to have separate providers- one giving the sedation with propofol and a separate person doing the procedure. Good luck- you will feel so much better after this is over. Propofol is QUITE safe when used by qualified providers at an appropriate facility. This means that an anesthesiologist should be present. At the very least, someone who is experienced with propofol should be giving it. It should not be given by the same person doing the procedure, in my opinion. I give propofol to every single patient that goes under general anesthesia and it is my PREFERRED drug for sedation. Honestly, I think spinals have more risk than a propofol sedation in qualified hands. Most of the drugs we use aren't necessarily reversible. And even if they are reversible, the reversal agents usually aren't used or needed. So, the fact that it isn't "reversible" doesn't mean anything. Most sedatives and anesthetics aren't reversed. They just are metabolized by the body and their effect wears off over time. So, propofol isn't different as far as that goes. It sounds like you are saying that you will have a sedation anesthetic. This means "semi-conscious" or not completely unconscious. Sedation (with propofol or any other medication) anesthesia is titrated- meaning, the dose is adjusted based on your need. Propofol is one of the shortest acting drugs we have so if you do get too much for a short time, it will be that- a short time because it wears off so quickly after a sedation. The anesthesiologist or anesthetist will be monitoring you for the right level of anesthesia and will take care to keep you safe. I've even done general anesthetics (complete unconsciousness, placed a breathing tube, etc) with propofol as the main agent (rather than the usual anesthesia gas) because I think it's so easy to adjust and get rid of at the end of surgery (by lowering and then stopping the infusion). The side effects are predictable for most people and patients say they had a "good rest" and don't get nauseated from it. In fact, it helps to prevent nausea. Compared to spinal anesthesia, propofol is easier to adjust. With a spinal, the medication is injected and you get what you get. Either the spinal is adequate OR it's not. You can't add more medicine after it's been done. If it doesn't last long enough, you get general anesthesia anyway. If it lasts too long, you end up in recovery for HOURS trying to pee and move your legs. The blood pressure drops from a spinal can be more pronounced too. AND, most people need sedation with their spinal anyway to be comfortable in the operating room or not care what's going on around them. Don't get me wrong, spinals are great anesthetics for the right surgeries. I, personally, would prefer a propofol sedation over a spinal for outpatient surgery anyday, both as a patient and as an anesthesiologist who has to give each. Hi,is it possible to answer this soon? I had endometrial cells in my pap,need a D and C at a surgical center.i have stenosis so have to do the biopsy this way.i have a phobia about being "under". The Dr and surgical center said they use Propafol,and I read that it is dangerous because it is NOT reversible. I asked for a spinal,and they are trying not to do that . My question is why can't they sedate me partially,and why not another reversible drug,and is Propafol safe from ur experience? Do people sometimes not ever wake up from it? I am terrified to be put UNDER. What would they do if I had problems while under,if it is not reversible!???? Please advise,I may cancel if I keep feeling so scared . Thanks so much! Probably not. There are some centers that are experimenting with, or doing these with nerve blocks and sedation. But, that type of anesthesia may end up making you more anxious in the end. In order for you to have thyroid surgery, your face will be covered (or partly so) with a drape. The surgeons will be pressing on your neck. Even if you have numbing medicine, you will still feel the pressure and the tugging and pulling. It would potentially make you feel like you can't breathe. I suspect that the anxious patient would not do well in this situation. Further, the surgery is very delicate and slight movement on your part could be quite dangerous because of the blood vessels and nerves in the area. If you are anxious, it is unlikely that the anesthesiologist will be able to sedate you deeply enough to ensure no movement. If they sedate you enough that you don't respond to any stimuli, then that is, by definition, general anesthesia. At anything close to this level of sedation, it is likely that you wouldn't get enough oxygen. Then, the anesthesiologist will be forced to try to intervene to secure your airway. This is quite nearly impossible while they are working on the front of your neck. With sedation, the more deeply sedated the patient is, the less able they are to voluntarily cooperate. Your head and neck are positioned in a manner that would likely not be well tolerated by an awake or sedated person, with a roll under your shoulders to help expose the surgical area. It would be much more dangerous and would interfere with the success of your surgery to have you awake. It would be a rare patient, I would think that could tolerate this with safe levels of sedation, unless it is done at a hospital with personnel (surgeons, anesthesiologists, nurses, etc) who are trained and equipped to do so. The monitoring and thus, the wires and machines are essentially the same whether you have sedation with local, or general anesthesia. Your safety is much easier to secure under general anesthesia for this surgery in most cases. So, it is unlikely this will be an option for you unless you are at a center that is set up to do them this way AND you can assure them that you would not panic while the sedation is adjusted to the right level AND you can tolerate needles that are used to place the nerve blocks and/or local anesthesia AND the nodule you are having removed is very small and superficial (easy to get to). Not trying to make you feel bad, but want to tell the truth. I'm sorry this is stressful and anxiety-provoking for you. I had a total thyroidectomy under general anesthesia and did just fine. Actually, it was the easiest of all of the surgeries that I have had. Good luck. Hi Kenneth. If it helps at all, I've had my entire thyroid removed under general anesthesia. The relaxing medicine used before going to the OR really do help. You will feel relaxed and may not remember much after getting the medicine. During anesthesia, the anesthetist is there the whole time. We monitor your heart rate and rhythm. On the continuous EKG that we have, we are able to see any changes that also indicate that oxygen isn't being delivered adequately to the heart. That is a very, very unusual occurrence, even in people known to have artery blockages around the heart or other heart problems. We monitor blood pressure, usually checking every 2 to 5 minutes via an automated cuff that measures and records the value automatically. Anesthesiologists are extensively trained to respond quickly, decisively and skillfully to any change in vital signs that may mean the patient is in danger. And while we spend a great deal of time and thought learning and preparing for that eventuality, it almost never happens. When it does, it usually isn't unexpected- there are usually risk factors that tell us what the dangers are for a particular patient. Of course there is some risk to anesthesia, but honestly, it has gotten safe enough that I have had five general anesthetics and two epidurals, myself. My 20 month old baby had anesthesia and my 90 year old grandmother did as well. I would not allow that to happen if I didn't believe what I was telling you about safety. Can't make any guarantees, but usually the anticipation and worry is worse than the actual experience. Eventually, you cross the point where the problem you need surgery for is more dangerous than the surgery and anesthesia! Hi Polly. That is known as a "paradoxical reaction". We see this most with children. It can happen with them with the same medicine you got. Also, some parents will tell you that even benedryl (diphenhydramine) causes some kids to go bonkers rather than making them sleepy. It doesn't happen as often in adults and we don't really know why it happens, but it is just an occasional effect that we see. Sorry it happened to you, but I appreciate your comment.